HOW can you top a masterpiece like Metal Slug? The game blends some Contra style action with some over-the-top animation and a dash of comic mischief. MS was (and still is!) very welcome, considering Konami's brutalization of the beloved Contra franchise. Exit Contra, enter Metal Slug. 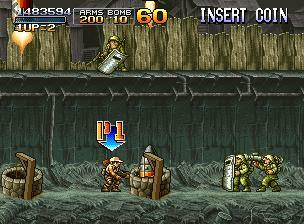 After Nazca's 1996 original, SNK (apparently having come into ownership of Nazca) put out Metal Slug 2. Metal Slug 2 has some kickass graphics that improve upon the first, but it unfortunately contains a monstrous amount of slowdown. This is a major strike against the 1998 sequel. But all is not lost. 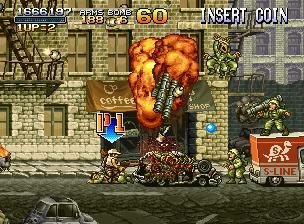 In 1999, SNK did an upgrade on Metal Slug 2. Called Metal Slug X, it fixes the slowdown. Aside from that, there are more than a few noteworthy changes to the game. You'll notice right from the start that the first stage now takes place at night. A few major enemies have been switched around as well. Throughout MSX, you can find some new weapons in addition to the classics. The Iron Lizard is cool- when shot, it skims along the ground until it rams into something. Basically it's a minibomb on wheels. The Enemy Chaser appears in the first stage and is your basic homing missile. The Drop Shot is like a bouncing cannonball. The Laser has been beefed up this time - it has a wider beam. More bonus point scoring opportunities await in MSX. If you find all the POWs and make it through the stage without dying, you get the "GREAT" bonus. Keeping your Slug vehicle results in a more substantial bonus. Most if not all of the MS2 secret bonuses are here, and Hyakumotaro Ichimonji returns as well. As for the control- you still cannot aim diagonally. However, this allows you to strafe targets that are above you. Graphically, it is even more splendid than MS2- from a picture, it looks as good as MS2, but the relative lack of slowdown makes the difference. The comical animations look better running at full speed. The slowdown is not totally eliminated, but it doesn't become troublesome. Some parts of MS2 that were RUINED by the slowdown are much better here. The "Big" ability is hilarious- if you pick up enough food items (vegetables, pigs, chickens, etc.) your character will fatten up and the announcer says "Whooa-oh...BIG!". You lose some agility here, but your weapons will be stronger. The Flame Shot will be bigger. You can pick up the Diet item to reverse this. Get hit while big, and your character will explode like a balloon. In the Egypt stage, you'll notice the banners flapping in the breeze closer to the end of the stage. Enemy vehicles will explode into lovely showers of kibbles and bits. 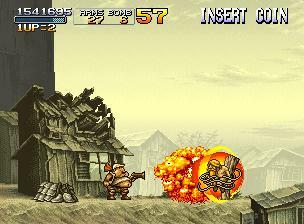 The music is the same jamming militaristic soundtrack of Metal Slug 2. Some of the enemy screams are hilarious. The announcer's voices are redone. You just have to hear "IRON LIZARD!" and "FLAME SHOT!". Even if you already have MS2, I give MSX a "Two Heavy Machine Guns Up" recommendation. This is frankly the game that Metal Slug 2 should've been. It's regrettable that MSX didn't make a Neo-Geo CD appearance.